The Widows’ Home had been founded in 1875 by a group of 18 women who had been spurred to action when they noticed the needs of older women in the city. Thirty-six years later, in their 1911 cookbook, it was clear that those who led the widows’ home were still motivated to do good and to share. They believed, they wrote in the cookbook, that “None liveth unto himself”–that life and blessings are not for hoarding but for sharing. I held a copy of this cookbook this past June when I visited the research library of the Berks History Center. As I looked through the many recipes packed into the slim volume, I found myself typing furiously to copy them all: strawberry shortcake, rhubarb pie, “Fastnacht” Cakes, apple jam, peach ice cream, maple mousse, and more. Hopefully I will have the chance to share more of them here soon! But…. 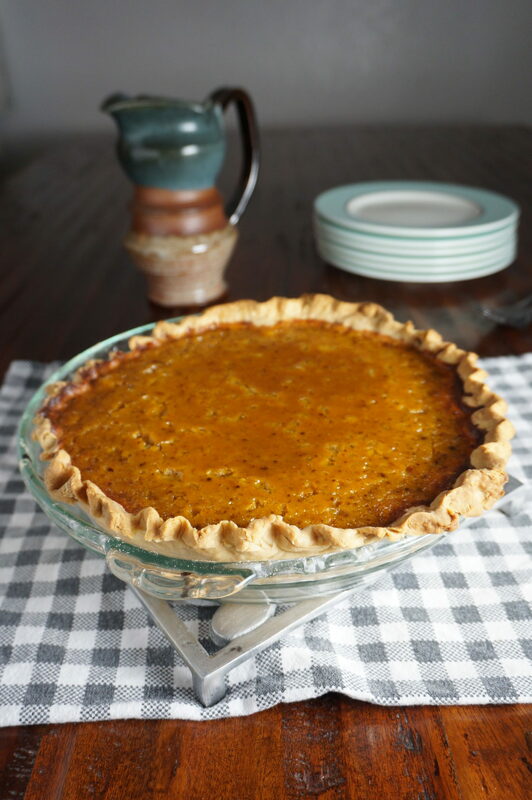 since it is October… it felt fitting to share the Widows’ Home recipe for Pumpkin Pie. To four cups of pumpkin that has been stewed and mashed through a collender [sic], add one-half cup of butter, five eggs, one-half teaspoon of ginger, one teaspoon of cinnamon, one-half teaspoon of mace, two cups sugar, one cup of good brandy. Mix all the ingredients well together and bake on a crust; bake the crust first, and then put your ingredients on the crust and return to the oven and cook till done. Here is how to blind-bake the pie crust (always the best course of action with custard-based pies!). And here is the recipe for my favorite, easiest pie crust! Mix all the ingredients well together. Add ingredients on the crust. Cover crust edges lightly with aluminum foil if desired (to prevent over-browning). Bake at 425° F for 15 minutes. Reduce temperature to 350° F. Bake for 40-50 minutes or until knife inserted in center comes out clean. Cool on wire rack for 2 hours. The Widows’ Home’s cookbook fundraiser worked. The Home lasted through the winter. In all, it lasted over 100 years, from 1875 to 1976.